From WWW, 50 authors 50 states, Montana 2013. Robert Scott McKinnon—the Story of Swimming and Greyhounds in Montana. One day, fifty-five years ago, as I waited to swim in the Pan American Games 400 meter trials, at Treasure Island, the University of Montana swim coach sat down, introduced himself, said he wanted me to swim in Montana. And so I rode my motorcycle north, and from the University Education Building I gazed out at Rattlesnake Creek … this was no Bay Area scene. Coach, you got a deal. My first experience with writing came via a conversation at the Grizzly pool. Part of my scholarship, I life-guarded adult lap swimming. A regular participant was a drama teacher, and from time to time we visited about this and that, and one day, he mentioned that the drama department was having a play-writing contest. My best guess, it wasn’t what I said, it was way I said it. In my entire life I had seen one play, in San Francisco: Archibald McLeish’s Job. Other than that I had no idea what a play was. I submitted the play on Deadline Day, informed there were a number of entries this year. I rather thought that maybe at the next lap swim I should hold my lap swim friend under … just for fun. A few weeks later, the announcement came: The Sport of Kings was a finalist? The drama department of the University of Montana was going to produce three one act plays. One of them was my play!!!!!???? The three plays were announced in the school paper. “We hear you’re having a problem casting it,” our diver said. I had a head full of soap foam. I nodded. I rinsed the soap out of my eyes, turned to look this bunch over. “You gotta be kiddin…” I said. Are you interested in dog racing? Have you ever wondered what goes on behind the scenes in this sport? 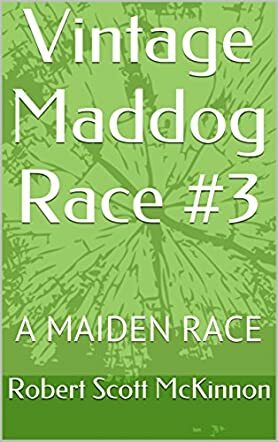 Vintage Maddog Race 3: A Maiden Race by Robert Scott McKinnon is a collection of short stories about greyhound racing. Maddog McDermutt is a master at the game of dog racing. In Vintage Maddog Race 3, join Maddog, Fleas, Stan, Ben, Elsie, Pooch the Mooch and a cast of others as you walk in their shoes and learn what they have to go through as dog trainers. They not only keep the greyhounds primed and ready to race, but you will discover how they determine which dogs run and which don't. Trainers like Maddog must have a keen sense to spot a winner, however, there are times when the trainer may underestimate the dogs that they train. One exception that was interesting in Vintage Maddog Race 3 was Ol’ Spot, who came on the scene with an element of surprise. The stories in Vintage Maddog Race 3: A Maiden Race by Robert Scott McKinnon had an interesting appeal. A few stories that you may enjoy reading are Cecaciciac, Flat Busted Broke and The Gutless Wonder which follow Maddog, Fleas, Stan, Ben, Elsie, Pooch the Mooch and the others through a variety of trainer experiences. If you have an interest in greyhound dog racing, consider Vintage Maddog Race 3: A Maiden Race by Robert Scott McKinnon.